Payday is around the corner (hooray!) but how will you look good this weekend when you're out of new buys and fresh styling ideas? Well, whether heading off for a chic brunch or saving yourself for cocktail hour, we have some fashion moves for you that involve your existing closet. You have a roll-neck, right? And a scarf? What about jeans? Well, duh! Re-Style #1: Zip up a biker jacket under a tailored coat. On Sarah Harris: Céline shoes. Re-Style #2: Layer a band tee over a roll-neck. On Veronika Heilbrunner: Gucci Dionysus GG Supreme Bag (£1310). Re-Style #3: Belt a long scarf over your basics. On Tiany Kiroloff: Tod's Wave Medium Bag (£1210). Re-Style #4: Wear glitter socks with everything—especially sandals. On the streets of Milan: Marco de Vincenzo Plait-Detail Patent-Leather Sandals (£595). Re-Style #5: Loop a foulard on your tote. On Elvira Meseguer: Calvin Klein jacket; Ragged Priest jeans. Re-Style #6: Layer OTK boots over true blue jeans. On Barbara Martelo: Louis Vuitton jacket; Saint Laurent jeans; Gianvito Rossi Knee Boots (£1130/£452) available in Black Leather. Re-Style #7: Pop on a hoodie under a blazer. 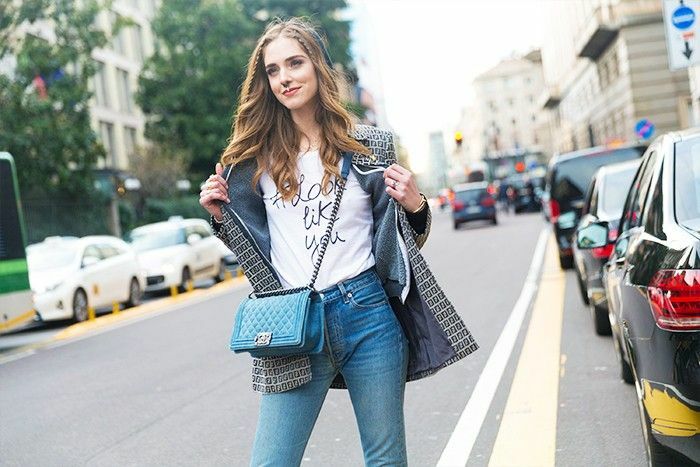 On Chiara Ferrgani: Fendi jacket; Chanel bag. Re-Style #8: Choose lace tights instead of opaques. On Carine Roitfeld: Chanel tights. Re-Style #9: Pin a corsage on your shirt. On Mie Jul (right): Gucci jacket; Theory trousers.